CC Ventures Inc., DonBros Realty Trust and CRE, Inc. have over 20 years of experience providing Bourne/Cape Cod office warehouse space for lease in the beautiful town of Bourne, Ma. We allows our tenants to attract employees from off cape town’s, south of Boston to Providence to all of the Cape and Islands. Our offices/warehouse and flex space provide access to Providence, Boston and all of Cape Cod within one hour driving. We strive to provide one of a kind quality space at affordable rental rates. Our customers are our best assets. We value their needs and work with them to help their businesses grow. We believe a mutually beneficial relationship with our current customers and our potential customers will reap equal benefits for our shared successes. insure that all electrical, plumbing, A/C and Heat will be in good working order. 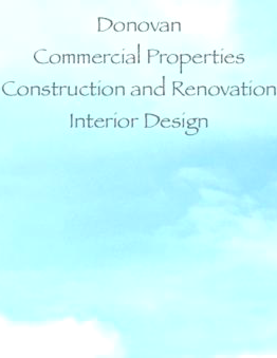 Donovan Construction Company, Inc. has been in business over 40 years. We specialize in making your home a custom design. Our skilled carpenters and sub-contractors make your experience enjoyable . We bring your vision to life. Click on our kitchen design picture to see our gallery or call us today @508-563-2740. Donovan Interior Design enables customers to tailor the design and aesthetics of their home with a unique and custom look. Our head designer, Kelly, worked in fashion and design in New York City for 15 years and brings a beautiful coastal feel to your home. From window treatments, to paint colors, to tile and construction choices, to furniture, we do it all. Kelly sources her products from niche designers and vendors to find exclusive fabrics and materials providing your home with affordable yet distinct decor. We want your home to be breathtaking. To see the gallery, please click on the picture or call us today @ 508-922-0315.